Amati 7397 Brush Locker with Lid! Protect your valuables brushes. Put some thinner or washing solution in the cup and suspend your brushes from the innner ring. The special clips hold the bristles above the bottom level so they don’t curl. Fumes and odors are trapped inside, keeping paint-filled brushes fresh and reday to use. While painting use the central hole directly to wash your brushes in the cup. 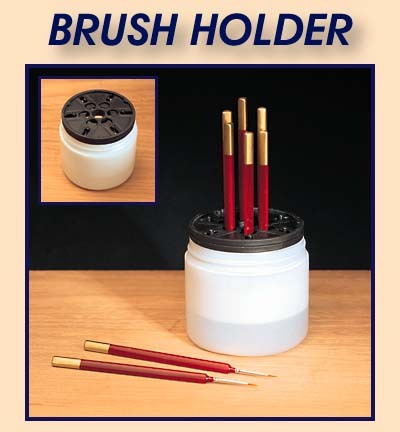 Holds 6 brushes.